Apple allows developers to respond to reviews, Spotify introduces exclusive new content and Apple forbids prices in apps titles. 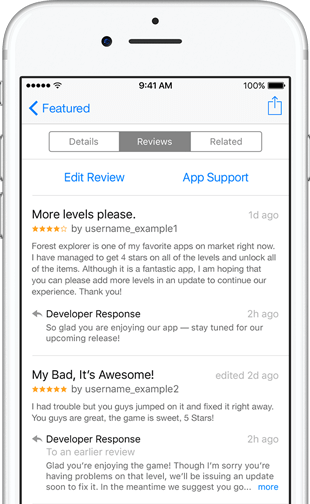 Exciting news has risen for developers in the App Store, as Apple informs that beginning with iOS 10.3, they’ll have the ability to reply to app reviews. This is exciting news for app developers as there currently is no way of directly responding to user reviews on their app. Most developers are forced to instead find a means of communication with users through email or social media. Starting on April 4th, each week the program teams up a new set of artists to collaborate on an exclusive new track. Featuring great legendary names like T-Pain, Joey Bada$$ & Sonny Digital, the show looks like it definitely won’t disappoint. All episodes can be found on Spotify under Spotify Original Videos. There’s been another shake-up in the app store as Apple now doesn’t allow developers to include the price of their app in the name, icon, screenshot or preview of their product. We’ll soon see a dawn of time for those animus ‘HUNDREDS OF FREE EMOJIS’ apps spamming the App Store. Apple has already begun contacting culprit developers, stating that the new changes must be implemented. We’re interested to see how far this could escalate if developers don’t comply with the new terms. What do you think about the new change? Could this be a way of ensuring compliant apps are given a priority for user searches? Let us know what you think by tweeting @hydricmedia.